While there might be little surprise over the countries found at the top and the bottom of the HDI, the ways in which inequality are experienced – and some of the factors exacerbating it – make for sombre reading. 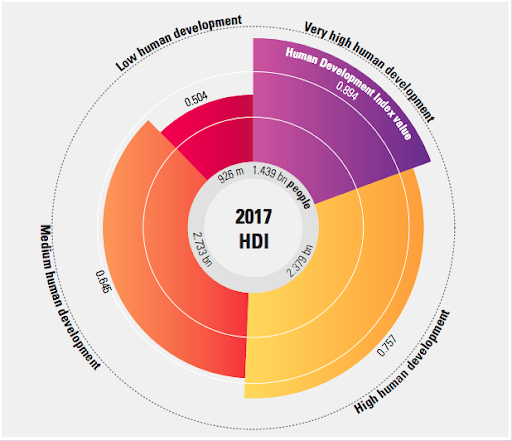 Norway, Switzerland, Australia, Ireland and Germany top the 2018 HDI. Rounding out te bottom five are Niger, Central African Republic, South Sudan, Chad and Burundi. There has been significant progress since the rankings began in 1990. But at a time when some countries and their citizens are enjoying periods of exceptional wealth and success, the gap between them and the poorest countries is still considerable. Some of these inequalities are causing profound harm to millions of individual lives. Differences in life expectancy between the best and worst performing countries are a vivid demonstration of what inequality means. The top five countries all have a life expectancy of more than 81 years, whereas individuals from the bottom-performing countries are likely to die 20 years earlier. The economy with the highest life expectancy is Hong Kong SAR (seventh in the HDI) at 84.1 years, and the lowest is Sierra Leone (ranked 184 out of 189) at just 52.2 years. The highest climbing country in the 2018 list was Ireland, which rose by 13 places in the HDI rankings for the period 2012-17. The Irish have a life expectancy of 81.6 years, spend on average 19.6 years in education, and have a gross national income per capita of $53,754. 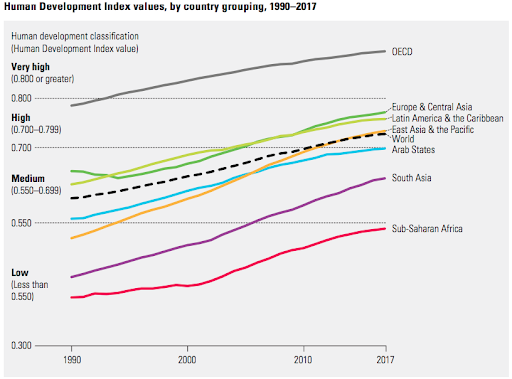 While wealth is an important part of the HDI’s evaluation, the index also demonstrates that there is more to development than money. The country with the highest gross national income per capita is Qatar ($116,818), which ranks 37th in the HDI. But a lack of wealth is certainly one of the major factors holding back development in some countries: Four of the bottom five have gross national income per capita of less than $1,000. 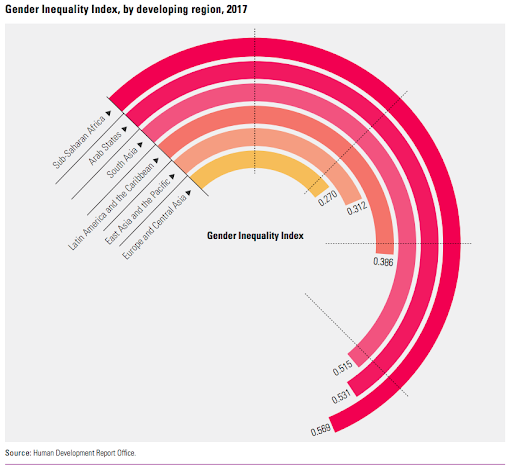 Two of the chief contributors to some countries performing badly in the HDI were, according to the report, gender inequality and armed conflicts. “Gender inequality remains one of the greatest barriers to human development,” Achim Steiner, administrator of the United Nations Development Programme wrote in the foreword for the HDI. On average women are 6% behind men in HDI terms, with countries in the low development category seeing the widest gaps. Current rates of human development progress indicate it could take more than 200 years to close the global economic gender gap. According to the Thomson Reuters Foundation, ensuring that girls have access to education is one of the best ways to open up sustainable economic opportunities and improve living standards. Selim Jahan, lead author of the HDI report, said this calls for a crackdown on problems such as child marriage, low levels of asset ownership among women and male-dominated political structures. War and armed conflict has almost become the norm in some parts of the world, and has led to some countries falling down the HDI rankings. This illustrates how the daily lives and future aspirations of people caught up in conflict are being held back, and in some cases permanently put on hold. Economic opportunities and average life expectancy are both likely to suffer in these cases, and the overall harm done could take many years to fix. One of the unintended consequences of improvements in HDI has been the impact on the planet’s climate and the damage to the environment. 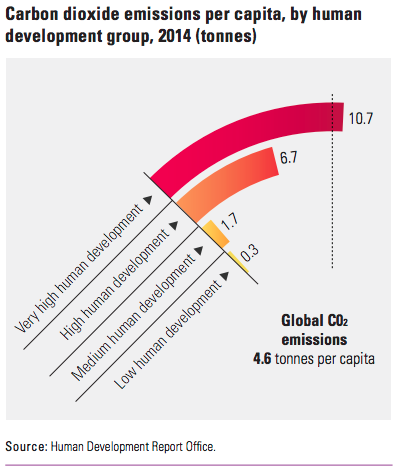 Although the picture is not uniform, the countries in the very high HDI category are also among the most polluting. Qatar had the highest carbon dioxide emissions per capita in 2014, releasing more than 45 tonnes per person. 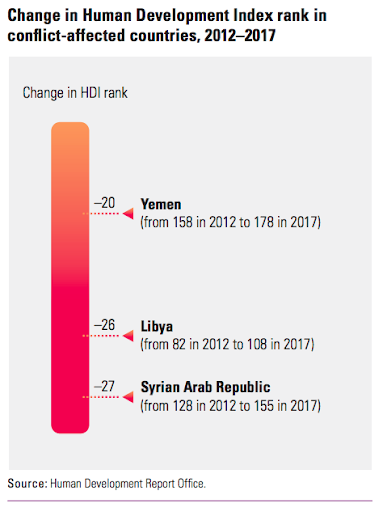 The lowest ranked HDI countries not only have substantially lower emissions of greenhouse gasses, they also tend to suffer the worst consequences of climate change.